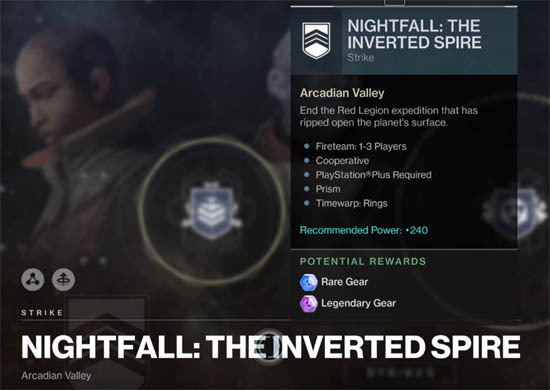 The Inverted Spire Nightfall is one of the easier weekly strikes in the game and certainly one for the SOLO players. In this guide I'll explain the best strategy for completing the Nightfall by yourself and claiming the Powerful Gear and much deserved self-praise in the process. Before we kick things off, let's take a moment to discuss the modifiers for the Nightfall which play a critical part in determining completion or failure. Rotation 1: Prism, Timewarp Rings. Rotation 2 (10th Oct): Attrition, Killing Time. During each of these "phases" the element that is highlighted will do extra damage. Players MUST take the opportunity to switch to weapons with these damage modifiers to do maximum damage during each of these cycles. Another critical part of the Nightfall is "Timewarp Rings". These are giant glowing rings in certain sections of the Nightfall. They start as a single ring and once jumped through, spawn in several additional rings for players to jump through. Jumping through each ring offers a 30 second boost to the remaining time. Running out of time during a Nightfall is a major headache so collecting additional time is pivotal to your success. Important: What some players don't realise is that the first ring does NOT despawn automatically. You can safely clear all the enemies within a section, then return to the first ring right at the end. This gives you a safer window to claim all of the bonus time without being killed. Health regen is disabled. Kill enemies and collect "wells of light" to recharge your energy. When this modifier is active, bring along any exotic perks and class abilities that help to regain health e.g. the Voidwalker subclass with Devour skill. Modifier first seen in Rotation 2. Simply kill enemies to top-up the timer. First seen in Rotation 2. You must select an Energy and Power weapon with alternate elemental damage types, topped off with a subclass for the final missing elemental type. For example, if I was a Stormcaller Warlock (with Arc Super and Grenades) then a Solar Energy and a Void Power weapon would be ideal. It's up to you what to choose in each slot but just make sure they're all different damage types. This allows you to continuously swap weapons during each of the Prism cycles to deal maximum damage. Your kinetic weapon should only be used on low level enemies, when other weapons are empty or as a last resort. Regardless of modifiers, I prefer precision, high damage weapons for SOLO Nightfalls. This generally means Scout Rifles, Hand Cannons, Sniper Rifles, Rocket Launchers etc. It's suicide to use Shotguns, Swords or other close combat weapons. On the exotic side, the MIDA Scout Rifle is a good choice for faster movement, Sunshot is excellent for Solar and exploding damage, whilst the Merciless exotic fusion rifle is great for BOSS DPS. Weapon mods to look out for include: damage x 3 multipliers, full auto mode (for Scout Rifles), cluster bombs (for Rocket Launchers) or other high damage mods are good choices. If you were a Destiny 1 player you'll know the importance of skipping sections in Nightfalls. There are several sections that can be skipped in the Inverted Spire in Destiny 2. After the "Eliminate the Vex" section, jump down the pillars and past the gladiator Cabal with the swords. Pull out your Sparrow and speed past the craters and right up to one of the buildings with the security guards inside. During the "Repel all Attackers" section, whilst the "Transit system is resetting", run circles around the edge of the room. You won't get hit and can safely watch the progress counter reach 100%. Straight after the "Repel all Attackers" section (when you escape using the jet engine "fling") call your sparrow again and whizz through the hallway, hop off and jump down to the next platform. Again, call your sparrow and skip this next section, all the way to the drill site. Always leave the Ring until you have cleared out all the enemies. Then go back to the first ring and jump through. This buys you a safe passage to jump through all of the rings in each section, giving your crucial time for the final boss. Always, always, always, switch weapons to match the active damage type (the one which appeared briefly on screen). If out of ammo, sometimes it's best to wait for the next cycle rather than force your way through. 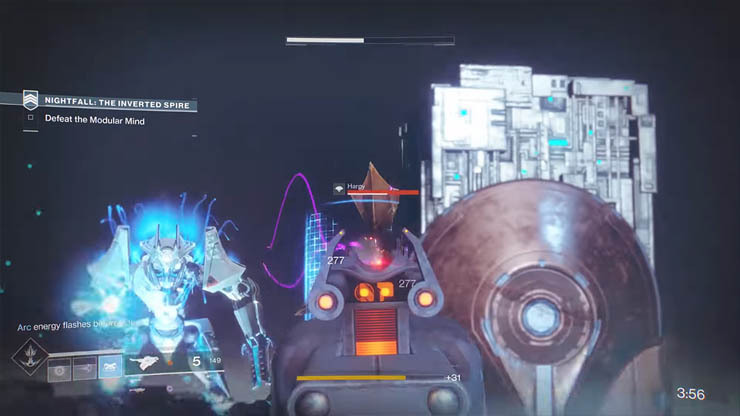 There are two areas where the Super is important in the Inverted Spire strike: once for the huge cabal that sits in the middle of the two buildings in the "Eliminate drill site security", and secondly during the final BOSS. Avoid using your Super at any other time during the strike or else you'll miss it when the time comes. In Destiny 1, the Warlock class had the upper-hand for Nightfall's simply because of the resurrection perk. That's gone in Destiny 2, along with the return to orbit penalty on death. Instead, Titan's have the best alternative with their Striker subclass. Striker has a new defensive barrier which blocks all incoming fire. With no one to cover your back, the wall provides a neat way to nip in and out of a fire fight, especially against the boss. The Striker has the option of two grenades and it's Super is also highly effective against the final BOSS. For Warlocks, the Stormcaller subclass is probably the one to go for with Voidwalker a close second. The storm grenade is by far the most effective and the extended Stormtrance Super provides enough power and time to wipe out two of the security cabal. Hunters, you'll need to choose what works best for you. I'd suggest you also opt for the most powerful grenade on offer and a long range Super such as Golden Gun for the final BOSS. 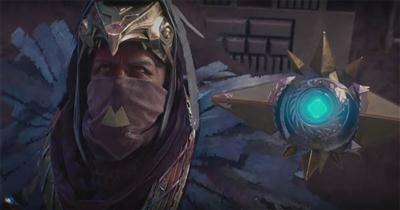 The Voidwalker (Warlock) always wins the race when Attrition is active. With both Devour and healing Rifts providing essential health regen, Voidwalkers have the best chance of staying alive when Attrition is active. For Titans, Barricade is still a SOLO players best friend so back this up with your best grenades (Pulse) from the Striker subclass and any exotic armour that helps regen health. Hunters, Golden Gun is great for the final BOSS fight so consider the Gunslinger subclass on this occasion. Simple enough really. Kill the enemies then use the Conflux and create the platforms. On the other side of the stepping stones, dash past the enemies to the first circular Vex teleporter. Immediately after jumping into the teleporter, pull out your sparrow whilst in mid air. Now race through the narrow tunnel to save time. For this section it's important not to jump too far down or else you can't get back up to start the ring jumping process. Instead, jump down to the first ring and leap across to the longer platform on the right hand side of the room. Stay up top whilst killing all the Vex safely from above. Once all the Vex are destroyed, backtrack to the first ring and claim the additional bonus time by jumping through as many rings as possible. I prefer to jump along the right hand side again, circle round to the left and claim the two rings in the middle, drop down to the bottom and get one last ring here before getting flung up the jetstream to leave the area. Use the elevated platform on the right side of the room, stay high up and away from immediate danger. You can safely pick off the Vex from the ledge and backtrack to avoid splash damage from Minotaurs. Combine Scout Rifle long shots with the odd Rocket Launcher to get the room clear. Roughly speaking the timer should be near 8-9 mins at the end of this section. Skip these sections by jumping past enemies and using your sparrow to race all the way to the drill security section below. Now for a slightly tougher section. The key here is to race all the way to the first dome building (there are two to choose) using your sparrow. Avoid engaging with any enemies except those inside or on top of the security buildings. Other enemies will despawn once the security cabal are killed. Rather than go through the dome entrance, go round to the far right or far left (depending which side you're on) and then attack through the window. Kill the Psion on top of the dome first, then drop down (switch weapons to match the Prism modifier element if Prism is active). It's all guns blazing as you fire through the window into the dome building, killing the yellow bar "Blood Guard Legionary". During Prism, if the modifier matches your Super at this stage then go after the huge "Honored Colossus" cabal in the middle, then move across to the other dome building and do the same for the other "Blood Guard Legionary". For other modifiers, follow a similar strategy but without waiting for the matching elemental burn. Once all three are dead, the other enemies will despawn allowing you to complete another ring jumping exercise (if Rings is active) and get your timer back to a respectable 8-9 min mark. For these three sections it's easy going. Run circles for the "Repel all attackers" section and then use your sparrow to skip past the "Cross the Dig Site" section. Do NOT waste any time killing enemies here unless you are near the 10 min mark and want to collect Power Weapon ammo for later.. Nothing too difficult here. Take your time, clear out the small enemies. If Timewarp Rings is active, go back for the rings once it's safe to do so. Make no mistake, the final BOSS is the hardest part of the Nightfall. Although straight forward with a fireteam, going SOLO against this BOSS is hard. The BOSS has three phases and the first is the hardest simply because of the enclosed area and the annoying Harpy's. Get past that first phase and the rest should be easier. The key now really is timing. If Prism is active, kill the three Harpy's so that the elemental damage modifier changes to match your Super right as the Modular Mind spawns in. Then unleash grenade(s) and your Super to cut through his first portion of health. When other modifiers are active, still clear out the Harpies first and again unleash your strongest weapons all at once on the BOSS. Fingers crossed and you'll breach that first portion and the floor will disappear allowing you to drop down below. If you can't do enough damage first time, focus fire on the BOSS's critical spot (forehead) and forget the Harpy's. Forcing your way through this part is tough and some deaths are inevitable. After dropping down to the second section there are no small enemies. Hide behind the far pillar (away from the BOSS), right on the ledge and focus fire on the BOSS. Jump when the fire spreads and don't panic if you die here. By the third section, you have much more room to move around but the small enemies are back. Make a point of killing them first before focusing on the BOSS again. By now you may have access to a final Super - make it count then focus fire again until the job is done.